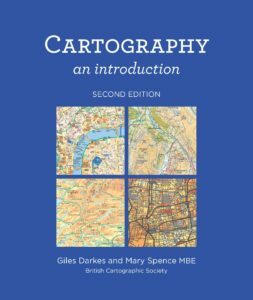 The British Cartographic Society have updated their classic book ‘Cartography: An Introduction’, developing the first edition from 2007. This book is a great overview of key cartographic concepts, covering everything from colour and symbology to fonts and the finer points of kerning. The book is accessible and a very valuable resource to anyone involved with cartography and looking to make better maps. others). Everything you might expect to be there is present, including scale, generalisation, colour, text and font usage. The book is packed with useful tips and rules of thumb (“If you use more than 12 colours on a map, it becomes very hard to interpret” and “Labels on coastlines or the edges of large lakes look better if they are places out at sea. Try not to straddle the land/water boundary”). I was slightly surprised not to see more on Colour Vision Deficiency (colour blindness), with the rule of thumb I have often used: avoid using different shades of red and green on a map (as red-green CVD is the most common form). Many cartography books are often either explicitly software specific, or clearly show the influences of one specific piece of GIS software. This book manages to be software independent, although the legends will look familiar to regular ESRI users! The concepts are written in a way where they can be applied to the map making process in any software or medium. The book finishes with a list of key tips or things to check if you have 5 minutes, 15 minutes or 50 minutes to finalise your design.This pulls out the key aspects and accepts that sometimes we don’t have enough time to spend on the design as we would like. ‘Cartography: An Introduction’ is available at a very reasonable £12.99 from the BCS and it is a book I would recommend to anyone creating and designing maps on a regular basis. This book review was first published in the Society of Cartographers Bulletin (PDF, 2.6MB). This entry was posted in book on 28 August 2018 by Nick.